This is among our favorite pieces ever written about us, and extensively covers our story and point of view. Please read! Think about your favorite protein—maybe it’s lamb chops, beef filet, or duck breast. Now think about how often you may eat your favorite dish—special occasions, maybe a handful of times a year, or if you’re lucky, monthly? Many people may consider steak or pork to be their favorite dish, but don’t consider the way they are farmed and slaughtered. The same people that love steak, may actually be disgusted by images of the whole animal being butchered. They have removed the idea of the animal when it was alive to an ingredient or delicious finished product. A similar transformation must occur for us with #edibleinsects, and we need to redefine our relationship with them—we need more chefs and cooks posting their Ento-Dishes so that people can start craving and imagining edible insects as deliciously plated food. Join the movement! 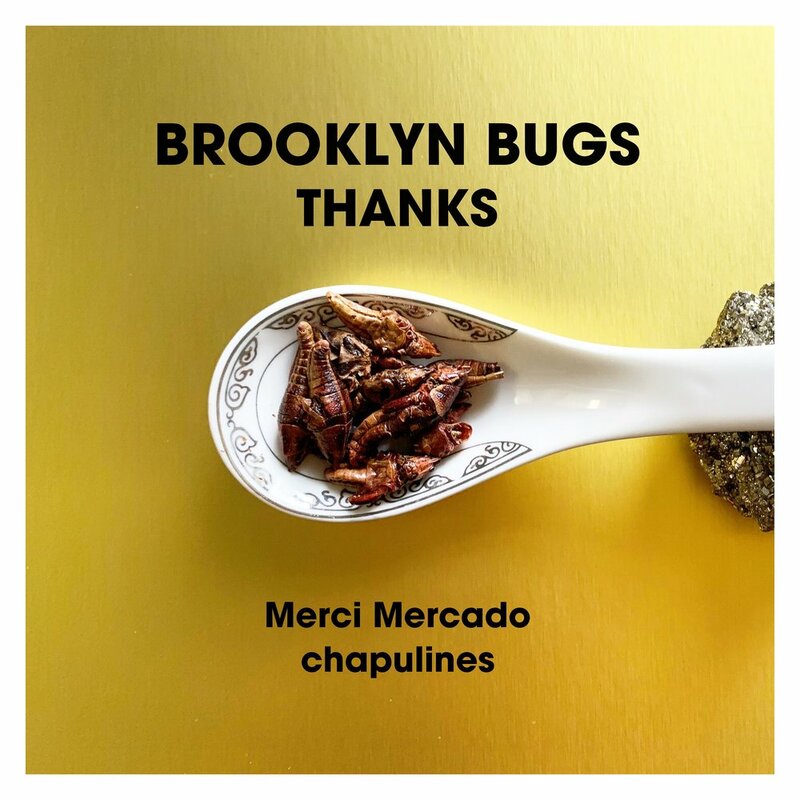 Thanks to our sponsors Merci Mercado for their delicious chapulines (grasshoppers). We all make sacrifices in our lives for what we consider is either better for ourselves or our environment. Maybe it’s walking up a flight of stairs instead of taking the elevator, or bringing your own tote bag when you go shopping, or buying locally grown, organic foods. 15% Off All Brooklyn Bugs Tickets Until Halloween! *Full Episode Streaming - please share* What an incredible opportunity for us to share why the UN endorses #edibleinsects to address the issue of food scarcity, and provide a solution for how we can responsibly and sustainably feed the world’s burgeoning population in the near future. This is not a food trend; it is a MOVEMENT in the western world. After all, 80% of the world’s nations already eat edible insects, but it’s been marginalized and stigmatized in western culture. Edible insects can be farmed sustainably, with far less resources and harm to the environment, are scientifically proven to be nutritious, and most importantly, it is an ingredient that is farmed and harvested for human consumption. We have to separate our idea of bugs as pests, and edible insects as a food ingredient for humans. Think about the human heart—it’s an organ. But somehow, Valentine’s or Cupid or whoever was able to brilliantly reimagine the symbol of the ❤️ as a universal sign of love. This is what I challenge everyone to help us do. How can we normalize a sustainable, nutritious, and delicious product? Our answer is through education and engagement. We want to engage chefs, students, scientists, children, policy makers, artists, writers, and everyone to this MOVEMENT, to help raise appreciation and awareness for the practice of eating edible insects. We are inclusive, and want to build the community—we need your help and involvement to do so! We don’t advocate for people to exclusively eat edible insects, or give up meat entirely. Rather, if even ten percent of Americans ate edible insects once a week, for Buggy Thursday, even that would have a tremendous impact on our environment. Thanks to the Smithsonian Channel for featuring us on their #bugbites series, and to Live with Kelly and Ryan for allowing us to share our work with your audience. We couldn’t have asked for a better way to challenge millions of people to rethink their relationship with food. And as always, thanks to mom and dad for everything. We are thrilled to be invited to appear on Live with Kelly and Ryan to promote #bugbites, and our work with the Smithsonian Channel! Appearing on shows like this will help validate #edibleinsects and the work that we are doing to raise appreciation and awareness for edible insects.